I wanted to post my goals for February because I thought if I posted them it would make me a little more accountable. So far, I’ve kept the goals, so I’m feeling good about that. Foam roll at least once every day. Practice yoga every day (class or video). Attend yoga class at least 4 times a week. I had hoped to wake up early and get in the run before heading to yoga class but since I stayed up to watch the end of the Super Bowl, I slept in a little bit and didn’t think I’d have time to run before class. 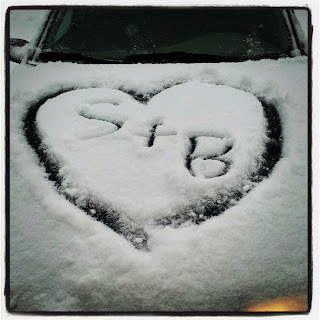 We got a few inches of snow overnight, and when I went to go clear my car off this morning so I could drive to yoga I was very surprised to find that Scott had cleared off my car for me. Class was amazing, and because it was a heated class I was sweating like crazy. I’ve been attending heated classes several times a week for almost a month now and I think my body is getting used to the heat. If we’re moving between poses relatively quickly I still get a little winded, but I still feel much better than I did at my very first heated class that I took back in August of 2011. After class, I headed home and jumped on the treadmill for a slow two miles to hopefully help me recover from my long run yesterday. My legs weren’t sore at all after the 10 miler I did on January 27th, but they were pretty sore yesterday evening, sore enough to get me to foam roll two separate times. My legs didn’t feel too bad and I kept it slow, so I think it worked. Did you work out today or take the day off to recover from the Super Bowl? Your fiance is too cute. I plan on working toward an April marathon and actually registering for it. Do it! Which marathon are you running? RnR Nashville is the only one that really fits in my schedule. I had wanted to run NOLA in Feb, but just won’t be quite healthy enough. I am both excited and terrified for Nashville. I hate hills and I heard it is all hills. I’m trying to pysch myself up and say it’ll be a good challenge – what doesn’t kill me makes me stronger type of thing. Aww, that is too sweet! Yoga 4x a week would be AWESOME! Does your studio have a great pass? I used to go to hot yoga… uh… once a month, but I felt the benefits every from THAT! My studio does have monthly memberships, which I have not taken advantage of yet, but likely will once I use up my current 10 class package. I love doing yoga esp after a run. 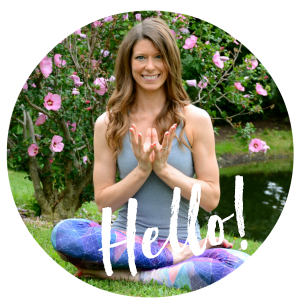 I have started doing it at home…love pigeon pose, bridge, childs pose…all incredible and good hip openers. That is so sweet of your fiance to write in the snow!! I hope you have a wonderful Tuesday! Post-run yoga is the best, especially when you’re able to get in a lot of hip openers. Running makes my hips so tight, which is a huge reason why I’m working on increasing my yoga practice. Aww how sweet of your finance!!! Good luck with your goals this month !!! New reader, but thought I’d comment. Your fiance sounds so sweet! Love reading your goals! Thanks very much! I’ll be checking out your blog! Your goals are my dream goals haha! Between marathon training, foam rolling and yoga, that sounds perfect! 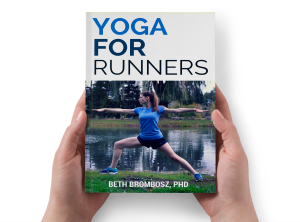 Marathon training may not be for everyone, but yoga and foam rolling are something anyone can do, especially if you just buy a yoga video and practice in your home (which is much cheaper than practicing in a studio). Honestly, my goal for February is to cut out soda again and drink more water. If I can accomplish that, I’ll be super happy. Good luck with giving up soda! I did that a few years ago and it is so hard! I drank a lot of sparkling water to still get the fizzy feel of soda, which helped a little, but there’s still something about the feel and taste of soda that’s kinda addictive.